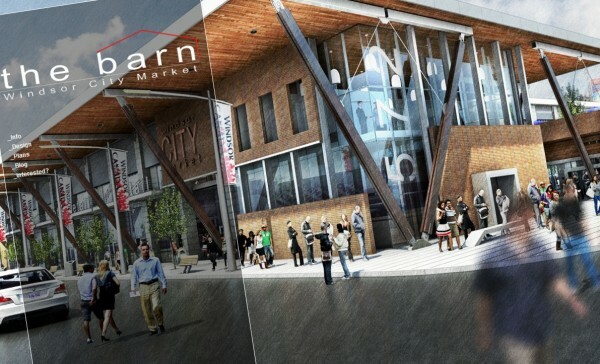 The former home of the Windsor Spitfires, Windsor Arena — affectionately known as The Barn by most Windsorites — will be transformed into a new permanent year-round Downtown Windsor Market. King Developments Ltd. prepared a major facelift plan for the market under the guidance of Windsor City Council and news of the plans were released to the public this evening. The project still must be approved by City Council, but Mayor Eddie Francis suggested that contractors are expected to begin transformation of the site in the spring, with completion slated for a year later. The interior plans call for 38 vendor kiosks, a permanent butcher shop, permanent bakery, a restaurant, a cafe, five “culinary incubators” and 38 retail spots. The arena structure will largely remain intact in terms of steel structure, but decorative glass elements and a major roof overhang will transform the corner of McDougall and Wyandotte Street West at an area where Wyandotte Town Centre meets the Downtown Core. A website has been set up with conceptual renderings for the plan.